I’m a natural-born rule follower. If there’s a rule in place, it almost never occurs to me to ask why it’s there or whether it’s worth following; it’s a rule, so unless it’s a pile of ethical garbage, I’m probably going to follow it. My preference for strong, clear guidelines in all things (Obligers, am I right?) even bleeds over into my reading habits. I’ll often set rules for myself about what I can and can’t read; it’s one of the reasons I’m so drawn to reading challenges, which lay out the rules in no uncertain terms: read books about these topics in this order. Ah, sweet, sweet order. Some people would find this incredibly limiting, I know, but I find it tremendously freeing! I know my general preferences, my likes and dislikes, and so rather than spend lots of time trying to convince myself to enjoy a genre or style that just isn’t for me, I remind myself that Book X or Movie Y isn’t in the rules, and I steer myself toward the things that have a higher success rate. But every rule has exceptions, and that’s what this post is about. Rule #1: No audiobooks more than 12 hours long. I resisted audiobooks for a long time, primarily because listening to them took me so much longer than just reading the book. I’m now a hard-core audiobook convert (thanks, Hoopla! ), but I’ve found that 10-12 hours is my threshold of enjoyment. It doesn’t matter how much I’m loving the book or the performer; at about 12 hours, I’m ready to Swear Off Books Forever. 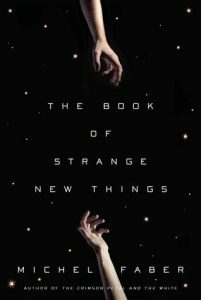 The Exception: The Book of Strange New Things, by Michel Faber (19.5 hours) – This sprawling novel follows a minister, Peter, who leaves his wife on earth to minister to an alien species living on a remote planet newly colonized by humans. It’s a dense, sprawling, layered novel containing dozens of characters, and the audiobook performer brings them all beautifully to life – including the alien species, who learn to speak English despite having no vocal chords. Rule #2: No contemporary romances. I tend to care more about character than plot, so mysteries, which are often very plot-driven, are a hard sell for me. But my real problem with mysteries usually comes down to one of two things: either 1) they’re way too easy to figure out, or 2) there’s no way you could have figured them out. Finding mysteries that strike that perfect note of “all the clues were there, and I could have figured it out if only I’d been smarter” is so difficult! When books in this genre work for me, they tend to be more character-focused suspense than pure mystery. The Exception: Any of the Phryne Fisher mysteries, by Kerry Greenwood – this absolutely delightful book series follows the adventures of Miss Phryne Fisher, lady detective, in 1920s Australia. 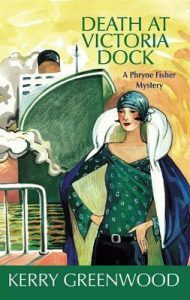 I first met Miss Fisher through her equally delightful TV series, Miss Fisher’s Murder Mysteries, which I devoured over a couple of long weekends; the books are a little less frothy than the series, but no less fun. Whip-smart, fashionable, and sure of herself, Miss Fisher keeps me coming back for more – and with nearly two dozen books in the series, I won’t run out anytime soon. I’m sure I’m not the only person who thinks this way. What about you? 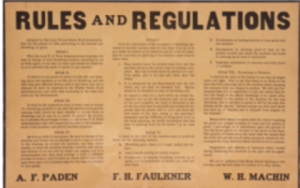 What are your reading rules and their exceptions? -Meredith Wiggins is a Readers' Services Assistant at Lawrence Public Library.